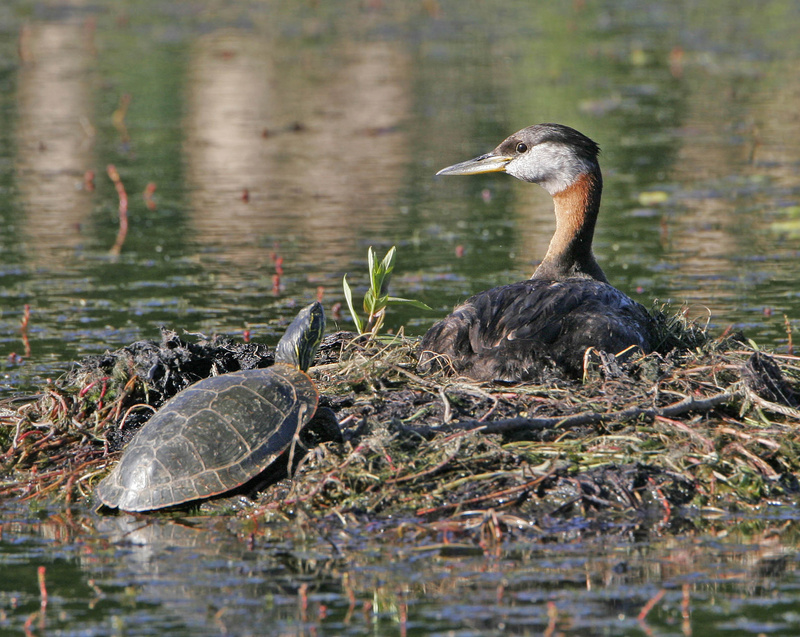 A red-necked grebe welcomes a painted turtle to enjoy the morning sun on her nest at the south end of Silver Lake. A resident of Silver Lake emailed a concern this month that he’d seen no nesting red-necked grebes around the lake. He wondered if motor boat traffic was foiling the waterfowl’s ability to raise clutches on their nests of reeds and grasses that float on the lake’s surface. Indeed, the wakes from boats can have an impact on grebe nesting, a setback that’s been documented at Loon Lake. But other birdwatchers have noticed the lack of nesting grebes and they theorize could have more to do with this year’s unusual weather pattern. I saw a pair at Sprague Lake in June that appeared to be working toward courting activity – in which they ultimately pair up for spectacular neck-curled dance across the surface of the water. But I don’t know that they nested. Now, as waters have finally subsided to some degree, the question is whether the grebes were simply late in nesting, or whether they will nest at all this year.